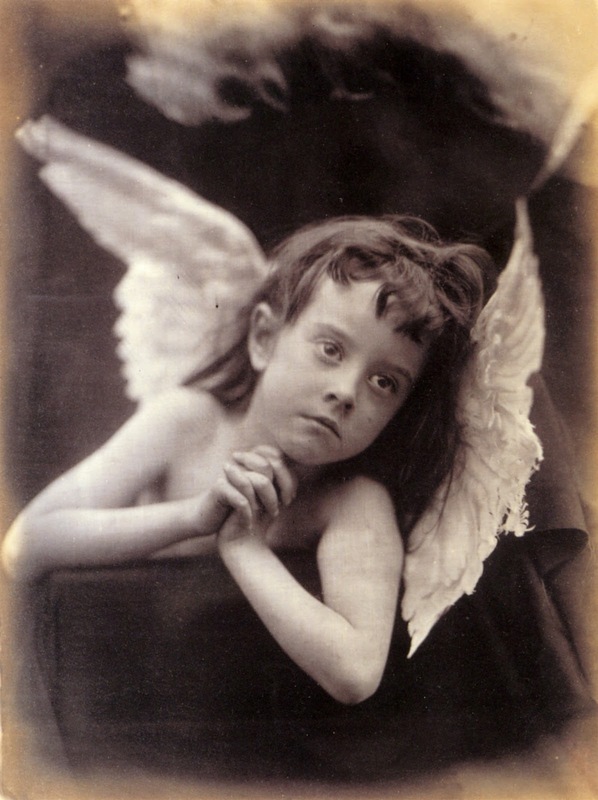 Laura Gurney inhabits the role of Cameron's angelic child, shared by many others. Just as Mary Hillier became the Holy Mother of the images, the protector of all the children she could hold in her wide arms, children seemed incomplete without those beautiful swan wings. 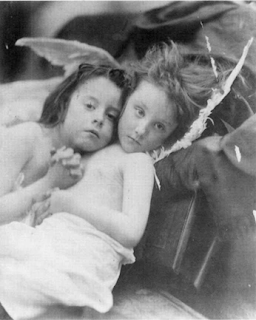 There are a suite of pictures of 'cupids' chubby and mischievous, but somehow Laura's pious and solemn expression is more angelic than pagan. I find the image Not Sleepy very interesting; on one level it makes me smile as the best way to photograph children is when they are asleep. My favourite image of Lily-Rose when she was a baby is when she was spark out, rather than the many others we have of her screaming her lungs out, red and angry and shouty (she has been an absolute angel from a year old so I think I got off lightly). 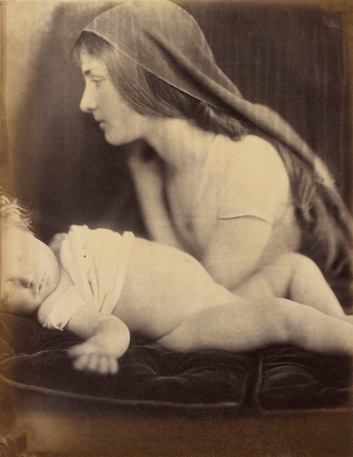 Many of Cameron's images of babies are asleep (essential for that long exposure), for example Madonna and Child from 1866 where Mary Hillier cradles a sleeping Percy Keown. However, a very similar image, The Shunammite Woman and Her Dead Son from 1865 shows Mary Ryan and Percy together, but this time he is meant to be dead. 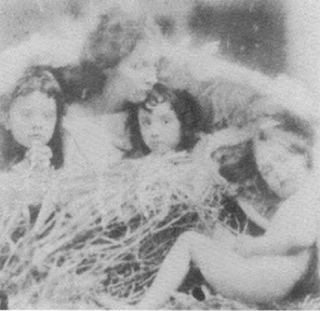 The reason I picked up on the poignancy of Not Sleepy for two very fidget-y girls is that in 1872 Cameron took four photographs of 10 year old Adeline Clogstoun (the same age as my daughter). What makes these photographs very difficult for me to look at is that they were taken when Adeline had died after an accident. She is stretched out in a bed, her hands folded and for all the world like she is sleeping. I have many questions about these pictures and why Cameron did not attempt to do the same when her own daughter died, but I find the images upsetting. It's when the mother part of me wins out over the art historian part, despite the fact that I am normally fine with post mortem Victorian photographs. 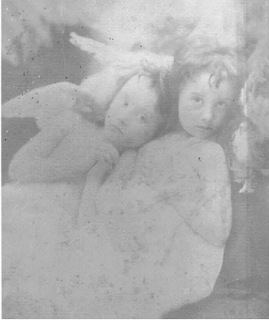 Anyway, given that the images of Laura and Rachel Gurney were taken in the November and Adeline died in the June of the same year I wonder if the image of a sleeping child had lost its appeal. In any case, I take the title Not Sleepy to be an very emphatic statement of the beauty of life, however much it fidgets. This Blogvent I will recommend the occasional book for your shopping list but mainly I will be asking very politely if you would please donate some money to Fanny Cornforth's memorial fund via our funding site. We have raised over £600 so far but we would love to reach our target, so if you want to help us remember a Stunner in need, pop over and donate. There are some rewards for various levels and each donation will help us towards our target, no matter how small.